Hi my name is Faamanatu(Natu), 23 years of age and currently unemployed. 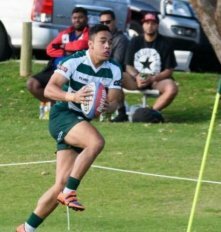 I have been playing rugby since I was age 11 in Hawkes Bay, New Zealand, I had my first taste of rep rugby at the age of 12 and I also took out the tournaments Most Valuble Player ever since then I fell in love with the sport. I continued my Dominance through my high school years achieveing honours of playing for 1st XV for 3 years and State Repersentive teams. This year is about thriving to go the distance in my rugby career which is why I truely prioritise it professionally which means looking abroad for any opportunities that come my way. Proffesional Aspirations and Objectives! Aspire to play rugby at an honors level and have always thrived to achieve the very best of my potential when it comes to playing on the field and the work done off the field trying to enhance my self and the way I play. I always overcome each challenge that is put in front of me and have learnt at a young age to not back down when the obstacles on the field get tough. I never give up and I will always keep working hard to where I want to get to with my rugby career.